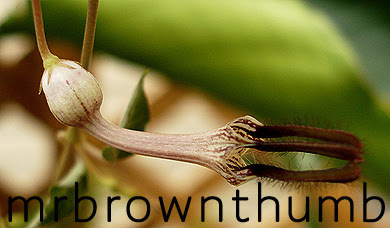 Ceropegia woodii is an evergreen trailing vine that is commonly grown as a houseplant. It is probably best known by String of Hearts because of the heart shaped green/marbled leaves. Another common name that it often goes by is Rosary Vine because of the tubers that are produced along the stems. I consider this South African native an easy indoor plant that can be grown by just about anyone with enough bright light- mine grow happily in a west facing window. When grown indoors if they're not given enough light the growth will be a light green color but under strong light the leaves and stems take on a deep green color. The two plants I grow are potted in hanging pots and I allow the stems to trail where they reach a few feet in length. But you can also wind the stems up a small trellis or topiary frame if you don't have the room to grow it as a hanging plant. You can allow the tubers, that grow below the soil, to fill the pot and become pot-bound before you repot your plant. C. woodii likes dry soil and over-watering is a sure way to kill this succulent plant. I usually wait until I see some of the tubers near the top of the stems have begun to shrink before I give it a good drink of water. I grow mine in bagged cacti & succulent soil I purchased at a garden center that I amend with a bit of perlite. I wouldn't recommend growing these plants in plain houseplant soil unless you amend it so that it drains very well. I purchased both of my Strings of Hearts plants here in the Chicagoland area. The first one I bought I picked up at Jamaican Gardens and the second one I bought at a local Home Depot. The plant I picked up at Jamaican Gardens (in Morton Grove, IL) has smaller and more triangular leaves. The String of Hearts I purchased at the Home Depot in Chicago has more of the heart-shaped leaves that give this plant the common name we know it by. This spring I placed both of my plants on the back deck and learned one lesson pretty quickly. While these plants like very bright light indoors when placed outside for the spring and summer care should be taken to give them protection from the strong midday sun. If you summer your plants outside make sure to place them in a partially shaded area of your garden or patio. Today I went out to check on my plants and noticed that both of them were blooming. I was surprised by the show of blooms because I haven't exactly been treating them well and since I've owned them they haven't received any fertilizer from me. The blooms are nothing short of fascinating even if they look a little phallic to some in my house. Possibly the best description came from my foster brother said they resembled wisks. Notice the little hairs on the edge? The inside is also has little hairs that trap small flies inside the "vase" until the hairs wither and allow the pollen covered fly to escape and go onto the next flower. Out of curiosity I put a bloom up to my nose and I don't know why I was surprised that it didn't smell good. I can't describe the smell but I can tell you that it lasted for an hour in my nostrils. If I had to guess I would say that there is a probably a special pollinator that isn't found in Chicago that pollinates these blooms. But I'm going to keep my fingers crossed because I've read a post on a garden forum by someone on the east coast who has had these flowers set seeds. I'll set it in the garden in an area where flies are sure to find the blooms and hope for the best. What an interesting post...not a plat I've heard of before. If I ever do see one I'll know not to smell it! I just found and bought my String o' Hearts plant at Flowerdale in Tustin, CA. I snapped it up as I had not seen one in years. It's vines are already 2 ft long and in bloom! BUT I observed that it's not in enough sun as the ends of the vines are getting thin and pale. So I moved her into a sunnier spot. Congrats on the find. I found a variegated one last summer that I still haven't posted about. But I'll be posting about it soon. My plant gave me 4 seeds!!! 9/25/09. I want to grow them. Any suggestions? Mini hot house? They just popped out of their "pods". I'm hopeful I can grow from seed. Hi Sybil, I just got your email and sent you a reply. I have a string of hearts plant that sets seeds! They are long and tapered pods and come in twos. So far they don't seem "ripe" or dry, but I'd love to try to sprout them. The flowers of my plant are a bit different, dark purple and cream, and It has very few tubers. Hi Cindy, That's great to hear. I haven't had any pollination of my bloom. Good luck with the seeds from your Ceropegia woodii. One of the seed pods that I had detatched has dried and opened to reveal silky-tasseled milkweed like seeds! I'll put them in a pot and report what happens. Cindy, Thanks for the update. Crossing my fingers for you. Hi, I live in Canada and this beautiful String of Heart (ceropegia woodii) doesn't exist here. Do you know where I can buy seeds to be send by the post. We can't either buy a plant from other country. I love this plant and I really want to have one. My e-mail. paulaoda@yahoo.com. I appreciate to have an answer. Thank you very much. I Live in Canada too (Montreal) And after unsuccessfully looking for Ceropegia plants in all the nurseries I know, I bought the seeds online (Mines arrived today after 6 days ). I paid 13 CAD$ for 10 seeds including shipping. Hi, also from Queensland Australia and have just bought my first one! I remember mum having these when I was little but I don't think it was the same variety as mine, I have a few friends want it too so have taken a few cuttings from my plant and put in potting mix, will see if they strike. Just wanting to know it anyone has grown from a seed as I have 4 sets of pods on my plant, and read that you put a stocking over them until they pop open to catch the seeds.